Recently, The Elder Scrolls Blades went live in "early access" for all players crosswise over iOS and Android, and after the debacle that was Fallout 76 a year ago, Bethesda gravely needs a success directly about at this point. Cutting edges is… most likely not it. It's a fairly capable Elder Scrolls understanding on portable, and there are a couple of things I truly like about it. In any case, Bethesda has not had the capacity to oppose the alarm's call of ultra-versatile style adaptation to the point where it taints each part of the amusement and makes the whole experience about 10% as fun as it could be something else. To start with, what works? I am extremely inspired with this diversion from a specialized point of view. This looks extraordinary on my iPhone X and I haven't experienced any slack or a solitary accident starting at yet. It's certainly in any event Oblivion level illustrations for the telephone, and totally one of the better-looking amusements I've seen on my telephone in a long while that wasn't grasping some particular vivified workmanship style. The controls are strong too, and despite the fact that it appeared to be to some degree silly that Todd Howard was making such a major ordeal about having the capacity to play the amusement with one deliver picture mode, this is really something I like about it the most. Having the capacity to play the diversion utilizing just a single thumb to move, glance around, square, assault, use abilities, and spells are extremely decent, and however picture mode confines your view more than scene (which you can change to), it really works entirely well all the equivalent. I like the leveling and ability tree procedure of the diversion, which is certain, more shallow than genuine Elder Scrolls amusements, yet not terrible for a stripped-down rendition and I'm getting a charge out of structure my character up. The "story" isn't profound, however it does exist, and the town building angle is somewhat flawless up until this point if somewhat unnecessary. Instead of being an open world you just burden legitimately into cell missions. At first, they were all pretty samey, a similar cell around multiple times over with slight changes, however at this point I'm beginning to see new sorts of territories open up, brigand camps, old remains, etc. There are some odd AI things like how you'll see undead skeletons wandering around a similar stay with criminals, the two not appearing to see one another, just set on uniting to execute you, however it's excusable. 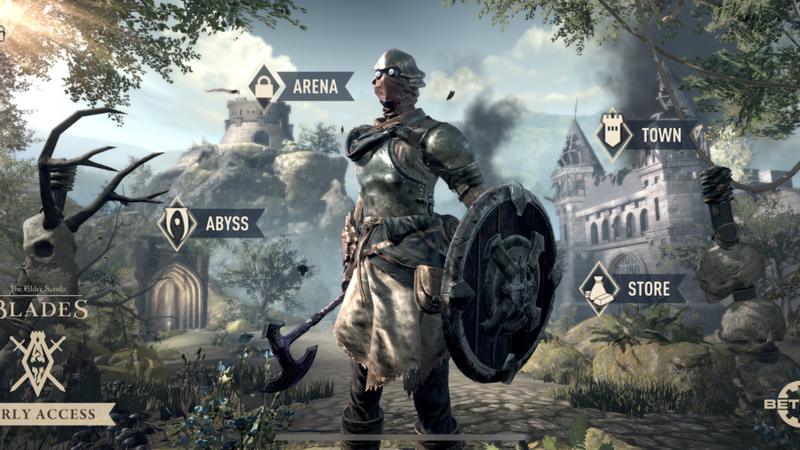 What isn't excusable are the sheer measure of microtransactions Bethesda has stuck into Elder Scrolls Blades every step of the way. I'll begin with the most exceedingly awful offense, which is the chest framework. Each mission will give you a chance to locate a couple of chests in the dimension that are "wooden" irregularity, open in five seconds and give you a couple creating materials. Be that as it may, most missions rewards Silver or TES Blades Gold irregularity chests, which take 3 and 6 hours to open separately except if you utilize premium cash jewels to open them in a flash (you can gain pearls, yet the rate is agonizingly low). This implies it takes everlastingly to get anything looking like fascinating plunder, and I've kept running into block dividers commonly in light of the fact that the story missions get too hard in light of the fact that my rigging is excessively low. Also, my rigging is too low since it takes 6 hours to get my prizes from the last mission I ran. This has brought about a circumstance wherein scarcely multi day I have 3 gold chests and 13 silver chests holding on to be opened, and you can just complete each one in turn. On the off chance that I time everything to the moment, that is 57 straight long stretches of chest opening to perceive what my real rewards have been from these missions. That is… not in the least fun, and counter to everything each RPG has ever instructed us. You do the mission, you get the prizes. You don't put the amusement down for 6-50 hours at that point get the prizes. Or then again pay to get them right away. Past this, Elder Scrolls Blades is simply… audaciously pay to win. In each and every way. You can level out simply purchase chests for $5, $10 and $30 for Gold, Epic and Legendary rarities. You can purchase incredible things inside and out which will come up as extraordinary offers (an unbelievable sword that mends on hit was offered to me for $10 my first day). You can even pay to auto-complete a few missions, in a flash remunerating yourself with materials and gold for doing actually only opening your wallet. You can pay to skip building clocks around the local area. You can pay to make quicker. You can pay to extend your stock and chest limit (and you should, which is the place 100% of my earned jewels have gone). This is simply ridiculous. I realize that Bethesda isn't the main organization in this space adapting diversions like this, however this is the sort of madly forceful adaptation I'd expect if there was a lady wearing a sheer sheet in the start-up screen enticing me to "come to play, my ruler." This is adapted like you would envision a no-name rip-off of Elder Scrolls would be, not Elder Scrolls itself. We have seen a lot of recreations discover accomplishment on versatile without depending on the most exceedingly bad adaptation impulses of the market from Pokemon GO to Fortnite. But then Elder Scrolls Blades makes a plunge recklessly, not simply contaminating its amusement with all the most noticeably awful sorts of microtransactions, yet fabricating the whole diversion around them. I don't have the foggiest idea to what extent I'll play this. This is the sort of amusement where I'll allow it seven days, get disappointed by moderate advancement, drop $20 on a bundle of top of the line poo and afterward stopped out of disgrace. In any case, by then Bethesda has just drained me and they couldn't care less. Or on the other hand I could simply stop now since I realize I'm making a beeline for multi-day hold up clocks and significantly bigger advancement barriers since I've been down this street previously. This is anything but a portable amusement intended for Elder Scrolls players. This is an Elder Scrolls amusement intended for portable players, which is a major distinction, and perhaps an impossible one except if real changes are made. Stay tuned with M8X for the Elder Scrolls Blades cd key, or you can check CD Keys to play more other games if you are interested.